Chicago Truck Accident Lawyer | Baizer Kolar Neiman P.C. Our Chicago truck accident lawyers have helped victims of auto, bus, bike and other accidents recover over $40 million in compensation in accident lawsuits. We have the experience to win a trial verdict if you have been in a major accident, as evidenced by the $17 Million case we won for a woman who was struck by a car in Illinois. Our truck accident lawyers also have the resources and experience you are looking for, as indicated by the $17.3 million settlement our injury lawyers won for a bus accident victim in Chicago. 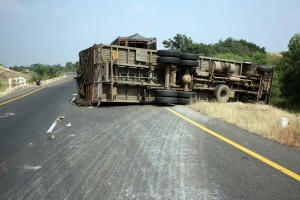 Our truck accident lawyers understand how difficult it can be for the victims of major accidents in the Chicago area. Whether you or a loved one has been in a bike accident, motorcycle accident, bus crash or car accident, our Chicago personal injury law firm is here to give you free legal advice on your rights to recover compensation against the party responsible for causing the accident. Whether you are looking for a truck accident lawyer, auto accident attorney, bus injury law firm or boat accident counsel, the personal injury lawyers at Baizer Kolar Neiman P.C. can help you start a claim to recover all of the compensation you are owed as a result of the injuries suffered in an accident. The personal injury attorneys offer all accident victims in Illinois free consultations to help them determine their legal rights and the firm accepts qualified cases on contingency, meaning injury victims never have to pay the attorneys until money is won. Our Chicago medical malpractice lawyers and brain injury attorneys obtained $19.4 million for a man who suffered permanent brain damage as a result of a medical mistake. Our Chicago personal injury lawyers won an $18.6 million trial verdict in a medical malpractice lawsuit for a boy who developed cerebral palsy as a result of a doctor failing to perform a timely cesarean section. Our Chicago bus accident lawyers obtained a $17.3 million settlement for a woman who suffered a brain injury after being hit by a bus while crossing the street. Our Chicago auto accident lawyers won a $17.0 million jury verdict in a lawsuit for a woman who was struck by car. Our Chicago birth injury lawyers won an $11.25 million trial verdict for a child who suffered cerebral palsy due to a delay in birth delivery. Our Chicago wrongful death lawyers won an $11.0 million trial verdict for the death of a teenager. For more information contact an aggressive Chicago lawyer at Baizer Kolar Neiman P.C. for a free consultation to discuss your car accident case and answer your personal injury questions.